This is probably not a good time to write a post about my feelings right now. There is a good possibility I'll write something I'll regret and an even greater possibility I'll write something stupid. But I think one of the reasons to have a website is to record one's own feelings at a specific period of time. What I'm feeling right now are frustration and anger at unbearable levels. 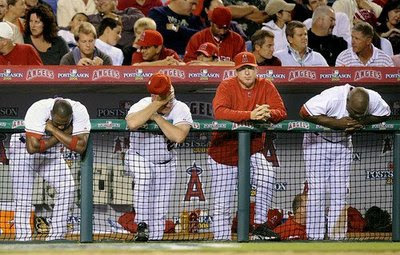 After the Angels 7-5 playoff loss tonight, the team is at the brink of another lost season. Not only that...but by another sweep at the hands of the Boston Red Sox. I'm going to do something I'll probably regret. I feel the need to irrationally vent. I know it's not productive to lay blame at a specific person's feet. So I'm going to choose a few. Since I'm in a highly frustrated mood...let's go ahead and do that tonight. Without the benefit of a clear head and good night's sleep. What the hell...maybe it'll make me feel better. Keep in mind that my opinion is hardly educated, or respected and is quite frankly emotionally driven. Not to mention, probably not coherent or rational in any way. Anyways, let's begin, first scapegoat...Mickey Hatcher. If a team is unable to get an extra base hit in two games in the playoffs...who else are you going to blame but the hitting coach? Of course a hitting coach doesn't hit for the team, but he should be able to get the players in the right frame of mind to do their job. Prepare them for what they might see from a pitcher. This particular team's inability to hit in the post season is inexcusable. This team won 100 games in the regular season...they had the best record in baseball. They have talented hitters such as Vlad Guerrero, Mark Teixeira, Torii Hunter and Garret Anderson. Somebody should be able to get an extra base hit. 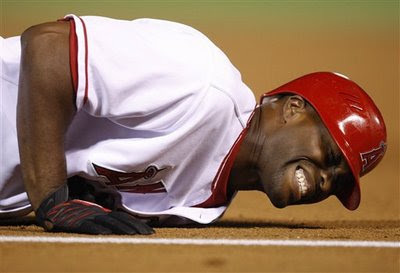 And yet the only extra base hit by the Angels in the series has been a triple in the EIGHTH inning of tonight's game by Chone Figgins. It's obvious that this team is not prepared, or doesn't have the confidence to succeed. Mickey Hatcher is the one to blame for that. Now I don't think he should get fired, I like the guy, but I do think he should be moved to bench coach and have someone else take over hitting coaching duties. Because whatever Hatcher is doing, teaching or saying...IT'S NOT WORKING!!! I'm not sure where all this talk of one day becoming a batting champ came from. But this kid doesn't have what it takes. He'll be a solid role player...I guess. He probably won't become an all-star or even a star. Batting champ? Give me a break. The guy can't even stay healthy. He has a horrible eye, and his swing is way too long. To top it all off, for several seasons now we've seen that Kendrick lacks the ability to hit in the clutch when it counts. This guy only gets meaningless hits, against mediocre talent...in unimportant games. I'd take Adam Kennedy over this guy any day. Today's box score for Kendrick, 5 at-bats, 4 strike outs with 6 men left on base....6!!! That's not going to get it done. He is obviously one of the main reasons the team has lost and is in this position. And if I hear anybody else call him a future batting champ, I'm going to shove my rally monkey down your friggin throat. 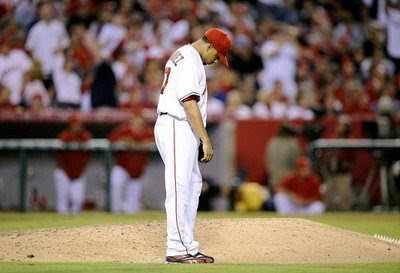 Scapegoat number three.... Francisco Rodriguez. Yeah, yeah, yeah, single season saves record...blah, blah, blah. I would've traded any one of those saves for just one hold tonight. When the team needed him most in the ninth inning of game 2 of the ALDS, he couldn't shut the door. Three outs, that's all the team needed. Momentum had already shifted in the Angels direction. They needed Frankie to shut the door. Instead he gave it up...two run home run by J.D. Drew. The worst kept secret in baseball is that K-Rod is one of the most over-rated closers in the game. His lack of production in the post season since 2002 is proof. Not to mention, his antics after a victory are inexcusable, his pitching choice is sketchy, and to top it all off, speaking from experience, since I've actually had the opportunity to meet the man on several occasions...the guy is a jerk. He's cocky, arrogant and rude to fans. Have fun pitching for the Mets...thanks for 2002...but you won't be missed... ingrate. Scioscia builds a team that depends on small ball, speed and timely hitting, then is shocked when the team fails to execute against excellent pitching. Championships depend on the long ball. It's been well documented. This small ball crap doesn't work. The team is brain washed into believing in small ball...and when the team needs a home run...they can't execute...cause they don't know how. I'm sorry, aggressive soft hitters, with poor on base percentages doesn't win championships. I'm not even sure why he adopted this philosophy, it's certainly not how the team won in 2002. Furthermore, although I see no shame in losing to a talented Red Sox team, it's become clear that the Angel franchise has no strong leadership. 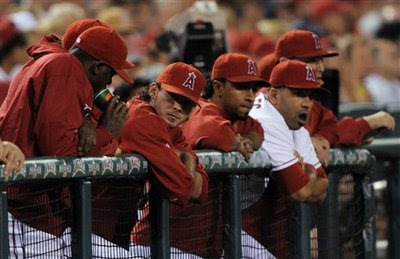 Whether it's a lack of leadership at the management level, the coaching staff or in the club house, the Los Angeles Angels of Anaheim do not seem to have the mental preparation, toughness and confidence to compete at the highest level, when it counts most. Especially against the Red Sox. I'm not calling for the firing of Mike Scioscia. But I believe he needs to re-evaluate his stubborn, ineffective tactics and take a long look in the mirror. This team has no excuse to be playing this bad...none. God, I'm so pissed....another pathetic, heartbreaking season from such a talented team.